24mototransport.com is another fraud site created by Romanian scammers. 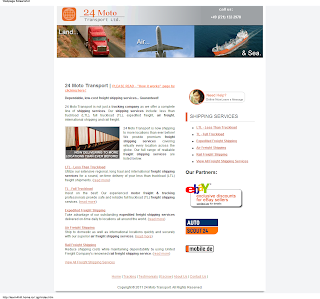 24 Moto Transport | PLEASE READ - "How it works" page by clicking here ! Dependable, low-cost freight shipping services... Guaranteed! 24 Moto Transport is not just a trucking company as we offer a complete line of shipping services. Our shipping services include: less than truckload (LTL), full truckload (TL), expedited freight, air freight, international shipping and rail freight. 24 Moto Transport is now shipping to more locations than ever before! We provide premium freight shipping services covering virtually every location across the globe. Our full range of realiable freight shipping services are listed below. "Recently my company used this company to ship several items to various countries around the world. My contact was Tom, who provided me with exceptional service each and every time we spoke. In fact he's working on resolving issues for me today as some of our shipments are still arriving at various ports. I just wanted to take a moment to thank Tom for the quality service. I will be shipping more equipment in the future, and I will most definitely be using 24 Moto Transport." As we discussed on Monday morning, Nov 18th, I'm really pleased with the performance of your service. I bought a 2002 Infiniti Q45 on eBay and originally chose to transport the vehicle with "24 Moto Transport". Before I agreed to work with them, they told me the vehicle would be picked up the next day and that I would get it in 4-7 days - all this for $875. After 7 days the vehicle was not picked up and they could not tell me when it would get picked up. I called you on November 6th and you told me the vehicle would get picked up the next day and that I would get it in 10-14 days. Well, as your records show, you picked up the vehicle the next day and I received it in 9 days! I did not mind paying $950 for that kind of service. Thank you George - keep up the good work!" "From quoting through delivery of my antique cabinet, I was thankful I chose Transit Systems. They responded to my inquiries in a timely manner, clearly explained my options, helped me follow up on my delivery status without any hassles, and my cabinet arrived safely when promised. I would definitely choose 24 Moto Transport again." "24 Moto Transport only works with quality reputable carriers, so I never worry. I want freight shipping to be simple and reliable, and that’s what I get from 24 Moto Transport." "24 Moto Transport is my primary shipping source for timely quotes, competitive prices and friendly customer service." "We know high definition, plasma TVs, touch screens and how to find any song in your collection in seconds. We don't know shipping. But 24 Moto Transport does. Contact them with the shipping address and they will tell all the necessary paperwork. My people aren’t spending their time shipping, they’re still with clients." "We enjoy doing business with 24 Moto Transport. They’ve always handled packages from point A to point B in a professional and timely way—there’s never a problem. We have them do all of our large freight." "24 Moto Transport was very professional. You did a great job arranging the shipment, and the agents who delivered my furniture were very nice and very professional too." ◦Both parties agree to terms, which includes a description of the vehicle, sale price and number of days for the Buyer's inspection. ◦When payment is received, it will be verified and secured into a non-interest bearing trust account. ◦24 Moto Transport verifies that the Buyer receives the shipment. ◦The inspection period will begins when the vehicle is delivered. ◦The Buyer has a 5 days for an inspection and the option to accept or reject the merchandise. For more information, read our General Terms and Conditions Page. ◦24 Moto Transport pays the Seller after all conditions of the transaction are met. 24 Moto Transport is a global provider of freight shipping services. 24 Moto Transport offers a complete line of domestic and international shipping services. We have established strong relationships with highly reputable carriers in all channels of shipping throughout the world, including road, rail, air and sea. We ensure that all of our carriers are properly licensed, bonded and insured. All of our trusted carriers have unparalleled track records for customer service and on-time delivery. At 24 Moto Transport our mission is to continue to provide the most efficient and reliable freight and logistics services in the world. We are disciplined and focused on servicing our customers' in every aspect of freight shipping and strive to provide the highest level of service available in our industry. 24 Moto Transport offers transportation services along most of the major international trading routes to customers throughout the world. From its corporate headquarters it operates an intermodal system, which combines sea, land, and air transportation, enabling the Company to provide fast, reliable, frequent, and complete door-to-door services around the world. 24 Moto Transport's Vision is to be a leading competitive global shipping and logistics company, setting high level standards in the industry. A company whose employees and partners identify themselves with its goals and values. A major strategic goal of the company is growth, both organic and through joint ventures and alliances, in shipping as well as shipping-related areas. As part of our customer-focused values, 24 Moto Transport emphasizes Introversion of customer's values, Adjusting 24 Moto Transport's services to customer values and striving for long term, mutually beneficial relationships with our customers. 24 Moto Transport strives to implement state of the art information technologies, promote e-commerce and knowledge management. 24 Moto Transport has established a quality assurance unit which is charged with obtaining ISO 9002 certification for the Company's units and upholding it thereafter; coordinating ISM (International Safety Management standards); organization and system services; and handling documentation changes and current needs. All 24 Moto Transport vessels comply with the International Safety Management regulations, and 24 Moto Transport is pledged to maintain the highest standards of safety and quality, as well as to comply with marine-environment protection procedures. Contact Us | PLEASE READ - "How it works" page by clicking here ! Contact us Monday through Saturday between 7am and 7pm (CT) to learn how 24MotoTransport.com® can help you manage your heavy freight shipping.